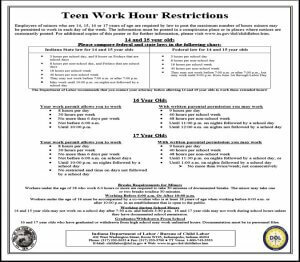 The Indiana Department of Labor has updated the Teen Worker Hour Restrictions posting with new work hours. Indiana employers with employees under the age of 18 in an occupation for which the employees must obtain an employment certificate must display the Teen Worker Hour Restrictions posting in a conspicuous location at the workplace (Indiana Code, §20-33-3-34). Covered employers must update their Teen Workers Hour Restrictions posting with the new 2019 posting to stay compliant. In 2018, the Indiana legislature enacted House Bill 1420, extending work hours to 14- and 15-year olds. Under the new law, a child who is at least 14 years of age and less than 16 years of age is allowed to work until 10:00 p.m. on days not followed by a school day as well as work more than three house on Fridays when school is in session. The law became effective July 1, 2018. The revised posting reflects the extended hours in a new chart that compares Indiana’s child labor law for 14- and 15-year olds and federal law for 14- and 15-year olds. Further, a statement recommending employers to contact their attorney before allowing 14 and 15 year olds to work these extended hours has been added to the posting. Employers with an Indiana All-On-OneTM Labor Law Poster can update their Teen Worker Hour Restrictions posting with the 2019 Indiana Teen Worker Hour Restrictions Peel ‘N PostTM sticker for only $9.95. If not, employers may order the updated 2019 Indiana All-On-OneTM Labor Law Poster.